Front of Giorgio Vasari’s Last Supper (1543), reassembled for the first time in nearly fifty years. Image courtesy Archives of the Opificio delle Pietre Dure, Florence. Giorgio Vasari’s Last Supperhas not been seen by the public since it was damaged during the flood of 1966 and separated into five pieces. 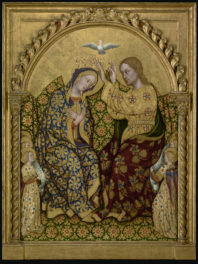 Now, for the first time in 47 years, the five wooden panels that make up the storied painting are joined together again to make the artwork whole as the result of a partnership between the Opificio delle Pietre Dure e Laboratori di Restauro (OPD) in Florence and the Getty Foundation in Los Angeles. Nearly five decades ago, thousands of works of art—from frescoes and sculptures to manuscripts and paintings on wood panel—were damaged or destroyed by a momentous flood in Florence, Italy. One of the most severely damaged works of art to survive was Vasari’s Last Supper, a large-scale panel painting (more than 8 by 21 feet) comprising five major panels, commissioned in 1546 by the nuns of the Florentine Murate Convent. During the flood, the painting was completely immersed in water for about 12 hours, and the lower portion of the work was under water for an even longer duration. Immediately afterwards, to aid in drying, the sodden panels of the painting were separated and an emergency paper treatment applied to the paint surface to prevent the paint from simply peeling away from its saturated wooden structure. Due to the enormous complexity of these conservation challenges, the artwork has been in storage since 1966, with conservators waiting and hoping for the future expertise to resurrect it. That time has finally arrived. As part of the Getty’s Panel Paintings Initiative, the Getty Foundation provided a major grant to the OPD in Florence to conserve the important work and to train seven conservators at the advanced, mid-level and post-graduate levels side-by-side with two leaders in the conservation field, Ciro Castelli and Mauro Parri. Deborah Marrow, Director of the Getty Foundation, explained that “The conservation work accomplished by the team at the OPD on the Last Supper is extraordinary and exceeds expectations, revealing this significant painting as a whole after many years. At the same time, the complexity of the work on the Last Supper has afforded a group of conservators at various levels of experience an unparalleled learning opportunity under expert supervision. It’s a remarkable achievement.” As the Panel Paintings Initiative has focused primarily on education and training, this is the best possible outcome. Positioning the panel vertically to align the margins of the joint. Archives of the Opificio delle Pietre Dure, Firenze. Now that the five panels that compose Vasari’s painting have been rejoined and provided with a stable system of wooden cross pieces and the original paint recovered, work will begin on the final conservation of the painted surface, which is expected to take at least two years or more. Old master paintings on wooden supports, or panels, are among the most significant works of art in American and European museum collections. Years of practice are required for a panel paintings conservator to develop the surgical skills required for intervention, including a deep knowledge of painting conservation techniques and exceptional woodworking expertise. Today, there are only a handful of experts fully qualified to conserve these paintings, and nearly all will retire within the next decade. The Getty Foundation, Getty Conservation Institute, and J. Paul Getty Museum together designed the Panel Paintings Initiative to ensure that the next generation of conservators is prepared to take their place. 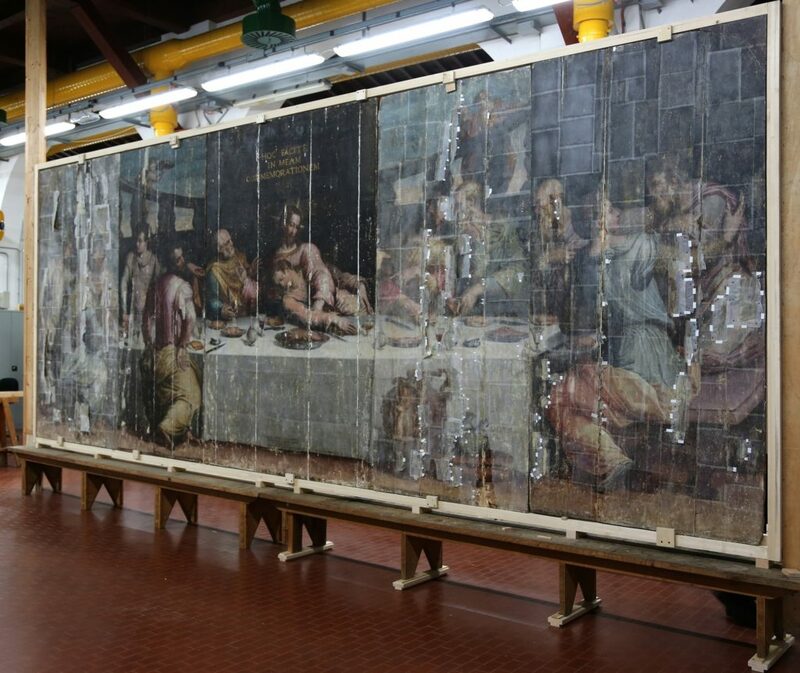 The treatment of Vasari’s Last Supper was ideally suited for training panel paintings conservators given the work’s size and structural complexity, as well as the extent of the damage caused by the flood. The intense water saturation made the wood soften and expand, which in turn stressed and lifted the painted surface, forcing dramatic cracks and breaks, and causing the gesso preparation layer to lose adhesion. Detached paint film due to of leaching of gesso binder. Photo courtesy Britta New, National Gallery, London. Wooden cross pieces on the back of the artwork that had kept the multi-panel painting structurally sound also failed, which literally left the five panels that comprised the structure in separate pieces. Now, after structural treatment, one remaining original crossbar has been properly repositioned, and others remade like it are in place to form a flexible support. This intricate work has been reproduced based on the system that Vasari originally devised, and serves to stabilize the painting, while also allowing it to expand and contract naturally with temperature and humidity. Vasari, the 16th century painter and architect, is perhaps best known as the “father of art history” because he originated the genre of artist biographies. The monumental Last Supper is among his many paintings in Florence. It has been moved several times over the centuries before being relocated in the early 19th century to the Basilica of Santa Croce in Florence. In 2004, the painting was transferred to the conservation laboratories in the Fortezza da Basso for further study and analysis by the OPD. 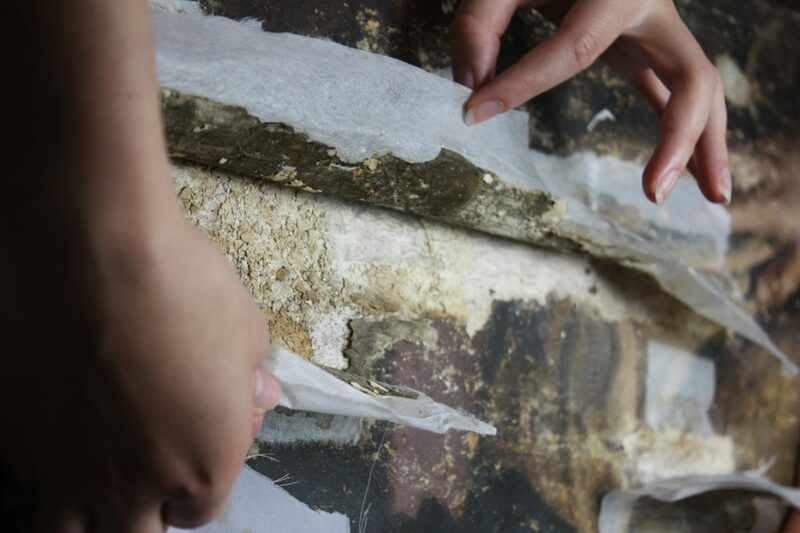 The current project focusing on the treatment of the wooden structural panels began in May 2010 and has been coordinated by Cecilia Frosinini, deputy director of the Painting Conservation Department at the OPD. Setting up router guide in order to cut V-shaped tracks for panel re- joining. Photo courtesy Britta New, National Gallery, London. Roberto Bellucci, senior painting conservator at the Opificio, oversees the project. Now that Belluci has accomplished the re-adhesion of the extremely flaked paint surface and the stabilization of the very fragile preparation ground has been accomplished, he will be focusing his attention on the restoration treatment of the painted surface. The finished result will be shared in a joint exhibition with the OPD and the Museo dell’Opera di Santa Croce, tentatively slated for 2016, as well as in a book on the conservation process. The treatment of Vasari’s Last Supper is among several training programs already underway as part of the Getty’s Panel Paintings Initiative. Other projects include the treatment of panels by Peter Paul Rubens from his Triumph of the Eucharist series at the Prado Museum, technical examination of panels by Pieter Brueghel the Elder in the collection of the Kunsthistorisches Museum in Vienna, conservation of three panels by Hieronymus Bosch at the Noordbrabants Museum in the Netherlands, and conservation of the iconic Ghent Altarpiece, which resulted in an innovative web application that provides unprecedented access to this masterpiece, all supported by the Getty Foundation. For more information about the Getty Foundation’s philanthropic work around the globe, including the Panel Paintings Initiative, visit the website. Old Paintings are a rich heritage. Glad to see the revival of Giorgio Vasari’s Last Supper. I happen to recently see some beautiful paintings by Peter Van Eupen. His work seems to have life and stir emotions in you. Paintings needs to be preserved with care as its a one and only one gem of a creation. People with the skill set and knowledge base of masters in their trade of the likes of Ciro Castelli, have unfortunately become increasingly rare. What he’s learned in a life’s worth of dedication, is condensed in what the newer generations of conservators are left to distill from these rare experiences. What seemed unfortunate of the PPI in not focusing clearly on creating an innovative learning experience to further this type of knowledge, has apparently resulted in centering itself in garnering headlines; which hopefully leads to more acknowledgment of the conservation needs in this specialized field. 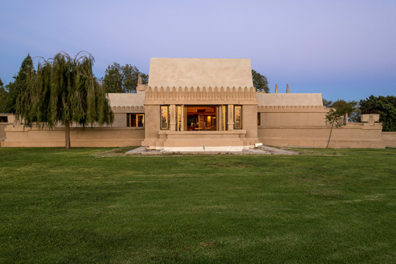 The work of Insitutions such as OPD and the Getty Foundation is priceless and invaluable .It should deserve much more attention by all the media, which too often emphasize futile topics.